Taught to play volleyball by his father (Robert), he has played with his younger brother Caleb ever since. 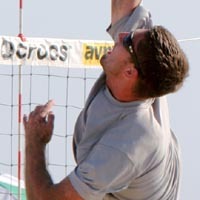 At the age of 18, he and his brother won the BB division of the AVPNext national tournament, then won the A division the following year (2000). Cook received a degree in Computer Information Systems from Nashville Community College, but did not play volleyball there. Nicknamed "Long."